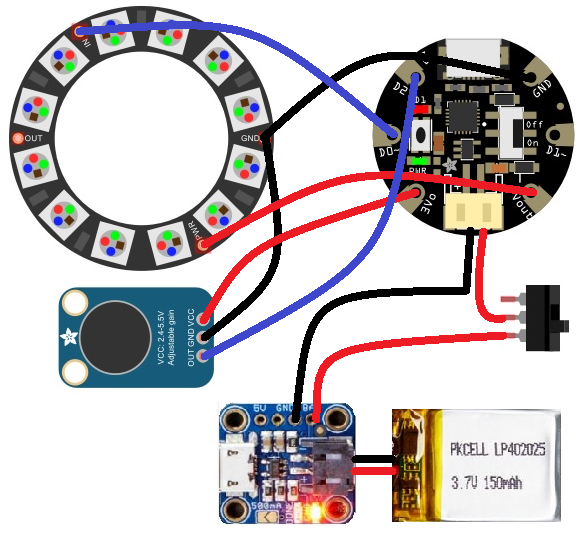 The circuitry for this wearable project isn't that complex, and the 3D printed enclosure will provide a nice pendant that you can wear to your next party or event. Most of the parts available through Adafruit. Their Weekly shows have 10% off coupons which are a great deal to pick up these parts. - Micro USB cable for programming/charging. - 22 AWG hook-up wire or any other suitable wire. Please download the .stl from thingiverse and print out the enclosure and lid. Some support material is required, but nothing intense. I used 1.75mm PLA printed on a PrintrBot Simple Metal at about 220 deg C (This is an "awesome sauce" beginner printer by the way!!!). Repetier Host was the 3D printing software using Slic3r. 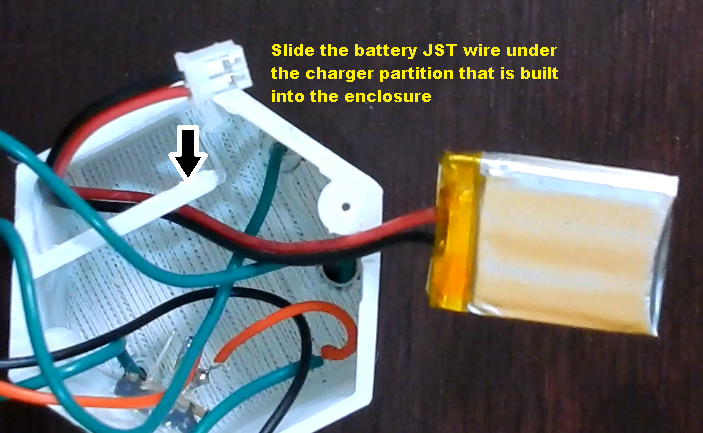 The enclosure was designed in Tinkercad. Used a PRINTinZ Zebra plate for the printer bed. The pendant assembly isn't that complicated. The enclosure was designed to comfortably hold the above-mentioned parts without much hassle. Please see the video for the assembly summary. Solder the RED lead of the JST-PH lead onto the middle pin of the slide switch. Please see the circuit diagram above for an illustration. 3) Push the slide switch into the opening on the side of the enclosure. Please see the picture below. You could use a small amount of super glue to the edges indicated in the picture. ***Please be careful not to encircle the entire switch with glue or else the switch won't work! You could also use hot glue on the inside to hold the switch in place. 6) Solder the LED ring wires to the Arduino Gemma according to the circuit diagram. 8) At this point, the soldering is complete. Lets program the Arduino before final assembly. You will need the Adafruit NeoPixel library for the sketch. Download the Arduino sketch from GitHub and load it onto the Gemma. Putting the Gemma into the bootloader mode is documented here. Once the sketch is loaded, test the flashing of the LEDs by tapping the mic. The LEDs should react to the sound. If it does not work, please check your wiring and ensure your Arduino sketch is loaded correctly. 10) If you want to insert a ring to hand the enclosure on a laynard, now would be the time before final assembly. I used a keyring and slid that on the enclosure as shown below. 11) Lets do the final assembly by inserting the battery first, then the Arduino Gemma. Now insert a small plastic spacer before putting in the MIC to prevent any short circuits. You can use a piece of plastic. I used a scrap piece of 3D printed plastic and placed it on top of the Gemma, then inserted the MIC on top of that.